The Plant Pathology and Entomology Group consists of 6 researchers totally, out of which 3 researchers are in charge of controlling plant disease caused by bacteria, fungi and plant viruses, and 3 researchers are in charge of controlling insect pests such as aphids, that can seriously inhibit production in large-scale upland farming in Hokkaido. We are doing research to develop the method for controlling the disease and insect pests from the viewpoint of fundamental research such as disease epidemiology, elucidation of the mechanism of infection and viral transmission, investigation of natural enemies, diagnostic techniques of diseases, etc. The main themes currently implemented in the group are as follows. We are re-identifying the species of pathogenic bacteria causing blackleg disease which has a great influence on potato production, especially seed potatoes in Japan. We are also working on developing the diagnosis method for highly sensitive and accurate detection of causal bacteria from plant specimens such as potato tubers and field soil, and investigating the dynamics of blackleg bacteria in plants and in the environment. 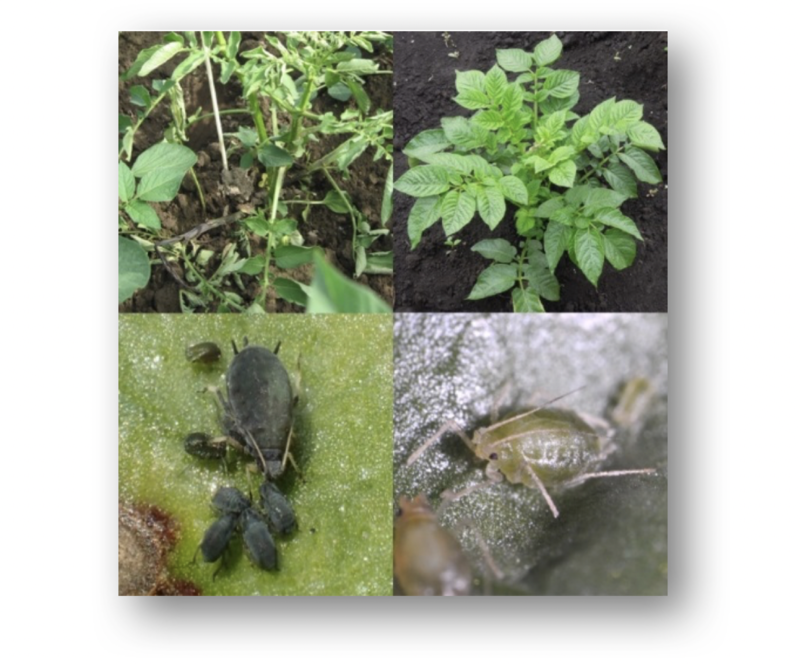 We are investigating the aphid species that transmits a new strain of PVY and are working to elucidate the cause of the proliferation of this new strain in recent years. We are investigating the aphid species that transmits BWYV to elucidate the route of infection. We are also investigating genetic resources of sugar beet with resistance to Green peach aphid that is considered as main vector of BWYV.